Thick cut pickled cucumber chips affectionately know as Wee Willies. Brined in Sun King's Wee Mac Scottish style ale with dill, garlic, and a hint of spice. This is truly a pickled pickle. These cucumbers are swimming in Hotel Tango Whiskey Mike Moonshine. Slightly sweet, perfectly salty & totally delicious. Think of these as a fruit cup for adults. Fresh pears & plumbs pickled in Flat12's Halfcycle IPA. Perfect for cocktails or picnics! 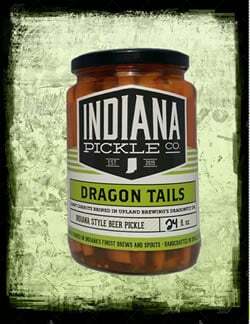 Just the right amount of spice give these pickled cucumber spears just the right kick to complement Triton Brewing Company's Rialsplitter IPA. Eating healthy has a new twist. These pickled carrots are sweet & spicy. Perfect for Bloody Marys, your charcuterie board, or straight out of the jar!